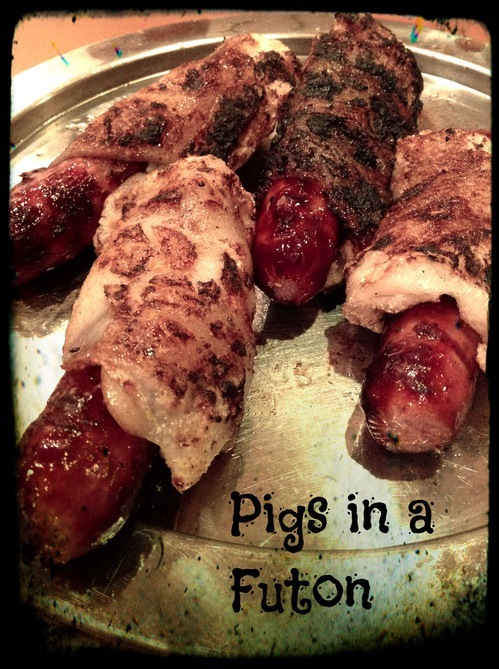 Remember "pigs in a blanket" from your childhood campfire days? I present Tod's newest fusion invention, Pigs in a Futon, a Japanese variation where toasted mochi replaces bread dough around the grilled sausages. We had a random set of ingredients that needed to be used last night and puzzled a while over how to combine them Tod joked about making these. I giggled over the name and we had to try. They were much more tasty than photogenic. The mochi is chewy and soft with crispy bits from the grill. Tod brushed the pieces with soy sauce to season and darken them. When they came off the fire, we stretched them around the sausages. We enjoyed ours with Japanese karashi mustard, but wasabi would have been delicious, too. Because biting directly into mochi can lead to extreme chewing and sometimes choking, a knife and fork were essential at the table. Pigs in a Futon are a tasty novelty for your next gluten free bbq.